Thoughts on my life and the lives of those around me. How do you determine the “value” of an education? Well, first you have to define “value.” The world would tell you to calculate the cost of the degree and the amount of money that it will help you to earn after graduation. You would then run some sort of cost/benefit analysis to determine the “value” of the education. But this approach defines “value” in monetary terms. The Bible defines value in an entirely different way. The implications of understanding this are vast and should, among other things, impact how we evaluate an education. In His sermon on the mount, the Lord Jesus tells his hearers the convicting truth that they cannot serve two masters, namely God and wealth, at the same time. Why? Because they can only be fully devoted to one at a time. They will either serve God with their whole heart (being content with what God has given them) or they will serve their possessions (and their desire to store up more possessions) and neglect God. Jesus commends the former and denigrates the latter. This is where kingdom ethics become so very interesting. They are opposite of what our sinful hearts want to believe. Our hearts what to believe that it is foolish to trust God with our needs and serve Him devotedly. But deciding to serve God whole-heartedly only seems foolish if you forget that God both knows your needs and promises to provide for them. Go and read Matt. 6:24–34 and see if there is any other conclusion to come to. God has promised to provide for our needs, so there is no point in worrying about them. Rather, we should find value in anything that helps us serve Christ. Is it not foolish idolatry, then, to evaluate a degree based on the world’s system? Rather, a degree is best evaluated by how it helps us to serve our true Master. This is why I will never regret going through the WEST Institute. How could I if I continue to evaluate things according to the kingdom’s system of evaluation? I learned so much during my time in Laramie, but more than that, I was given a set of tools that equipped me to continue the learning process. This learning culminates in sharing the truths of Scripture with others. If I am honest with myself I will admit that I have never been in want. I have never truly had a reason to think that God has not provided for the needs of my wife and me. This includes our time in Laramie where we were taught and trained for a lifetime of ministry. We were poured into and nurtured in a local church. We were blessed with the opportunity to exercise faith in God, and, of course, He was faithful. These fact eclipses the result of any cost/benefit analysis. 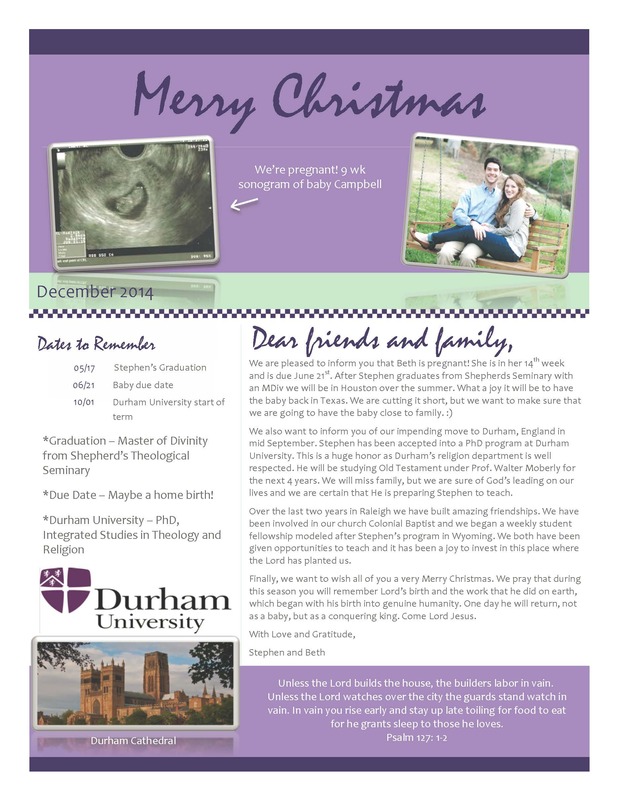 This post is to inform you that I have been extended an offer to study at Durham University in Durham, UK. This is a great honor as Durham is one of the most highly regarded universities in the UK and their Department of Theology and Religion is the top ranked religion department in the UK. I will be studying in their Integrated PhD program which is a revolutionary integration of a taught MA with the traditional 3 year research PhD. I will be studying under Professor Walter Moberly in the area of Old Testament Theology. My wife and I are so excited to be embarking on this new chapter in our lives. This past weekend my father-in-law Clark Niles retired from 47 years of youth ministry. He began at the age of 18 as a leader for Young Life. Afterward, he began working in camp ministries. After these years he became involved in the Texas Dioces of the Episcopal Church. He worked tirelessly for almost a half-century to train up the youth of Texas to know and love God. His retirement celebration was celebrated at Christ Episcopal Church in San Antonio. One of the great honors of the day was that the service was presided over by his good friend Bishop Bill Frey. After the service, Christ Church had a reception in honor of Clark. Many of his former students and parents of former students came to share how they knew him and what he meant to them. It was such an honor to be present. I feel honored to know Clark better than many. He is as genuinely in love with Christ in private as he has been in public for 47 years. Clark would like me to tell you that everything good about his ministry over these decades was in spite of him. God worked the most when he decreased and allowed God in increase. What a joy to know Clark and be a part of his family. Have you ever thought about the most important year of your life? Have you ever evaluated your life—where you are now and the direction you are heading—and wondered, “What has had the most influence on me?” Well, maybe you haven’t—and you wouldn’t be alone—but I have, and without a doubt one of the most influential years of my life, and the life of my wife Beth, was the year that we spent in Laramie, WY. Image this: It’s September 1, 2011. Beth and I had gotten married three days earlier. Classes for the WEST Institute have already started, and we are at the San Antonio airport waiting for the plane that will take us so far away from our family that we don’t plan on seeing them for quite some time. We get a call. It is Beth’s dad. He has cancer. In that moment we couldn’t help but ask God why He saw fit to take us so far away from family at such a time as this. We began to wonder what this year would be like without money to visit home. Was the wedding the last time we would see him alive, and we didn’t even know he was sick? Why are we moving to a small town in the middle of nowhere without job prospects or friends? Why am I planning to attend a seminary program when I have no intention of being a pastor, and I have already missed the first class? To say the least, this was a water-shed moment for us. We look back on that moment often and it is an encouragement for us as we walk forward. Our year in Wyoming was, bar none, the best and most important year of our lives. In that year, the first year of our marriage, we drew closer together than we could have hoped. We learned more about each other, ourselves, and the Lord than we could have imagined. We learned what it means to walk by faith and not be sight (2 Cor 5:7), and we experienced His faithfulness (Ps 86:15). We learned what it means to leave and cleave (Gen 2:24). We learned the value of God’s Word (Prov 30:5). We learned the beauty of God’s church (Eph 5:25–27). But, perhaps above all, the Lord used that year in Wyoming to lay a foundation for our lives and our marriage that He has continued to build upon (1 Cor 3:11). I say that this year was the most important year of our lives, because it was the year that our marriage and out lives became entirely centered on the Word of God. I shouldn’t end without telling you what you already know: the Lord provided. We found jobs and worked hard that year. We made friends and served in the church. We travelled and saw a part of the country that we had never seen before. We were also able to visit home over Christmas and take Clark to his chemo treatments, and, in the summer, he visited us—cancer free. The Lord does not issue a calling without also determining how it will be carried out to completion. This was a valuable lesson for two young believers to learn.